I blog about everything dog – from traveling with your pooch to training tips. 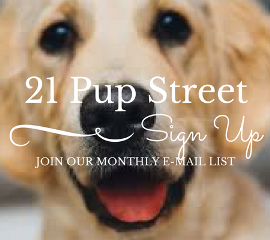 Founded in late 2016, 21 Pup Street is a steadily growing community of dog enthusiasts. I’m looking to partner with brands that would like to showcase their product through reviews and sponsored posts. I have previously worked with National Geographic Books, The PawPack and Pet Lifestyle and You (P.L.A.Y.). Contact me to see how we can work together to promote your dog product.